Unlike many boat builders in the Far East, Grand Banks has their own dedicated yard with a long-standing history of exceptional craftsmanship, consistent seaworthy construction, keen attention to detail, and meticulous quality control in every boat they build. Bluewater brand champions Mark Connors, Roger Mooney and Chuck Meyers recently traveled to Grand Banks’ Malaysia facilities where the trio expanded on their knowledge of the company’s construction processes and craftsmanship capacities– such as their in-house lamination, metal work and carpentry capabilities. One of the most notable aspects observed by our team was Grand Banks’ ability to mill their own teak accents. Due to the exceptional regional resources in Southeast Asia, the carpentry team is able to stockpile large supplies of raw teak on site throughout the seasons. Grand Banks craftsmen then meticulously dry and mill these high quality materials prior to crafting them into the signature steering wheels, beautiful toe rails and lustrous interior finishes the company is renowned for. Of primary interest to the Bluewater contingent during this visit was the final stages of construction on hull #2 of the 50’ Eastbay SX model line. This hull was built with Twin IPS Volvo 900D11 engines and was delivered to Bluewater Yacht Sales just prior to the Annapolis Boat Show. 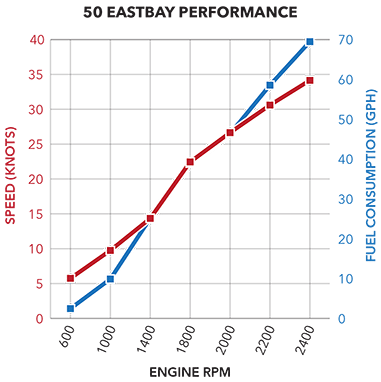 Derived from the original Grand Banks Eastbay 49, which debuted in 1998, the Grand Banks Eastbay 50 SX has resuscitated the aging beauty of the 49 while implementing a more efficient deep V hull design, more space and more modern European-inspired lines. This new take on an old classic still exudes all of the quality and craftsmanship that Grand Banks has been known for over their nearly 50 year history. The new Eastbay 50SX is also incredibly versatile, offering five different layouts with several option packages available for any of the differing layouts. Among the great features, our new Eastbay 50SX offers a galley-down option with twin master cabins with walk around berths and en suite heads. Beyond the standard features, the boat has been customized to provide an additional pullout sofa in the salon which is ideal for small children but could accommodate guests of up to 6’ in height. On the exterior, sun worshippers will appreciate the sun pad forward of the cabin, while their more UV ray conscious counterparts can enjoy leisure time under the aft awning that shades the entire cockpit and retracts seamlessly into the hardtop when not in use. The cabin top boasts an expansive sun-roof to allow for natural light and good air flow while underway or at rest. In the cockpit, an optional electric grill and a custom designed auxiliary helm center complete with joystick controls have been added. Coupled with a bow thruster and the state-of-the-art pod drives, the power system and controls provide for exceptionally simple docking and close-quarters maneuvering. “With the IPS pod drives she is easy to handle in the tightest of areas and even the most experienced boaters have come away from sea trials extremely impressed with the boat’s maneuverability, ” explains salesman Chuck Meyers. The tracking in a high speed turn is downright remarkable – at 28 knots the wheel can be turned hard over with no slipping or cavitation, and a look back from the helm confirms the incredibly tight turning radius she can achieve. Meyers also recounts after a sea trial on the Severn River, a customer noting that he could see down the entire river through the sunroof without missing a beat as the boat cornered aggressively. Also of note for today’s discerning cruiser, all this high-end performance is achieved with a very minimal sound signature – a mere 72 dB while cruising at 20.5 knots and 76 dB while cruising at 28.3 knots; with a top speed pushing 34 knots. With this marriage of innovation, performance and high-end luxury, we think you you’ll agree the Grand Banks 50 Eastybay SX is a marvelous cruising solution to behold.